recommended for all children who don’t like to eat vegetables and fruits. 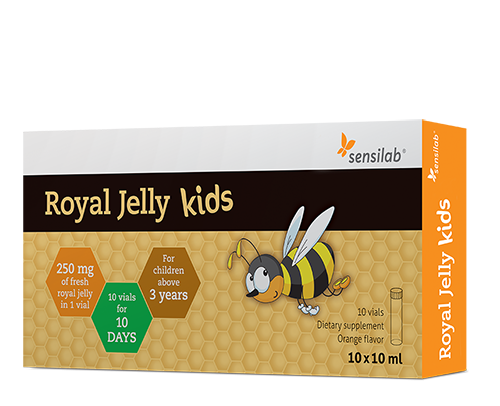 Royal Jelly is one of the most complete concentrated natural food sources in the world. This supplement used for restoring strength and energy while improving concentration and balancing the nervous system. Acts as a strong immunity booster which helps keep the child’s immune system strong. Royal jelly contains about 60-70% water, 12.5% proteins, 11% simple sugars, 5% fatty acids (the main acid is 10-hydroxy-2-decenoic acid (10-HDA)) and trace amounts of minerals and vitamins, especially B-complex. Suitable for children from age 3 and above. Use: Recommended daily intake is 1 vial, preferably in the morning. Active ingredients in 1 vial: fresh royal jelly 250 mg.